Warm Noticed:Please double check this handle just for regular mouth (2 3/8" internal diamter) Mason jars. The hangers made of stainless steel wire,Never Rusty for Outdoor Using,Better Properties of Elastic Recovery, and Longer Using-Life. 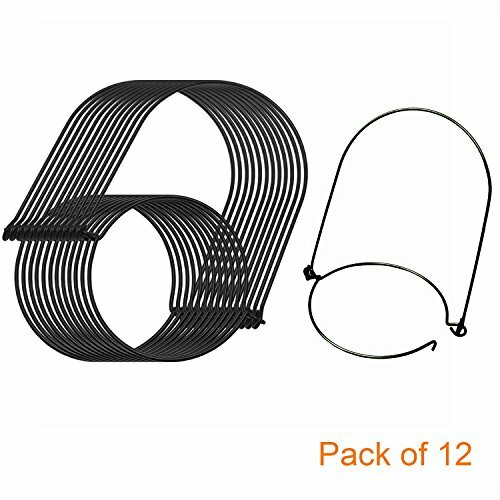 12 Pack Stainless Steel Wire Handles Hangers for Regular Mouth Mason Canning Jars. Made of Stainless Steel, Never Rusty for Outdoor Using,Better Properties of Elastic Recovery, and Longer Using-Life. Very Easy to Use them by your hand without Any Tools, Handle-Easy Designed, Tool-less, Take the Hangers on/off Anytime and Anywhere. Great for Yard,Home Decor, Mason Jar Lights,Party, BBQ,Outdoor Solar Lanterns Light and Hand-cranked Lanterns. Prefect for Most Regular Mouth Canning Jars,Like as Mason,Ball,Kerr,Golden Harvest,Kilner Jars. If you have any questions about this product by Aobik, contact us by completing and submitting the form below. If you are looking for a specif part number, please include it with your message.